The Numista database has reached 35,000 coins, and it is not always easy to find your coins. In addition, if you don't search carefully enough and you add a new coin page which already exists, it would create a duplicate. It is therefore necessary to efficiently search the catalog. To access the catalog search function, go to the "catalog" - "Search" from the main menu to the left of all Numista pages. Be sure to check this part that you are looking for (circulating, non circulating, euros ...), otherwise you won't get the result that you expect. The best thing to do is to check "all", which will show all coins that meet your criteria. Indeed, for example, a coin that you consider circulating may have been classified as non circulating in Numista and if the "circulating" is checked, it will not appear in your search results. Should I use the easy search or the advanced search page? Two search modes are available. Easy search is by keywords: if you do not know the country of your coin. Advanced search is by criteria: This mode is highly recommended if you know the country of your coin or if you have not found your coin by the easy search. Click the "Easy Search". This search is based on the inclusion of keywords. You can read the inscriptions. Write them in the field of easy search, also write a few descriptive keywords (see help for syntax ). You can't read the lettering on your coin because you do not know the alphabet. You can view different alphabets thanks to the drop down menu "special keyboard" and simply copy the symbols you see on the coin. name of the country, name of the currency or name of the monarch in specific language. representation of the arms or portrait of the monarch which you couldn't identify. 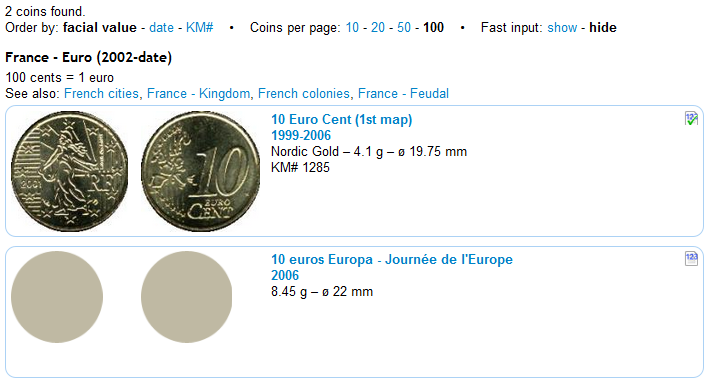 With an easy search by keywords you will find a coin which looks similar to yours. Then it will be easier to identify the country. Now an advanced search will help you to find your coin. Click the "Advanced Search." This research is based on 11 criteria. See the articles in Numisdoc to learn to read years that are not written in Arabic numerals (1,2,3 ...) but written in Ethiopian, Hebrew, Japanese, Islamic, Persian and Thai. The "Year" is what you read on the coin, "Gregorian date" is the translation of it in Western (Christian) Date. For example, for a coin of Israel (Hebrew alphabet and calendar) "התשמ"ז" which means 5747 is the year of the coin (in the Hebrew calendar). This date corresponds to 1987 in the Gregorian calendar. All countries have adopted a currency unit (Pound, franc ...) and most have adopted a subdivision currency unit (the penny, the centime ...). Correct syntax of this unit during your research will be important, it will save you many pages of results! What if I have not found my coin? If you found your coin in the "World Coin", you can search in Numista using the KM# in the advanced search. If you are new to Numista, and not a seasoned collector, if your coin is not in a precious metal and doesn't seem to be very old (before 1800) or very new (after 2010), there is a very good chance that your coin is already referenced in Numista. Then you can ask for help on the "Coin Identifications and Valuations" forum. Don't forget to post a good picture of both faces and to mention the diameter and the weight of your coin. If you are a seasoned collector, and your collection is very large, and your coin is in accordance with all creteria here above then your coin may not be in the catalog. In that case, you should add it by clicking on "Add it yourself" at the bottom of the page or by clicking here. Don't forget to read the Guidelines for editing the catalog.